The theme is fully widgetized as always. A special feature of this theme as we use in many of our themes is the logo changer. You can use the default WordPress setting (‘blog name’) or you can use your own logo. 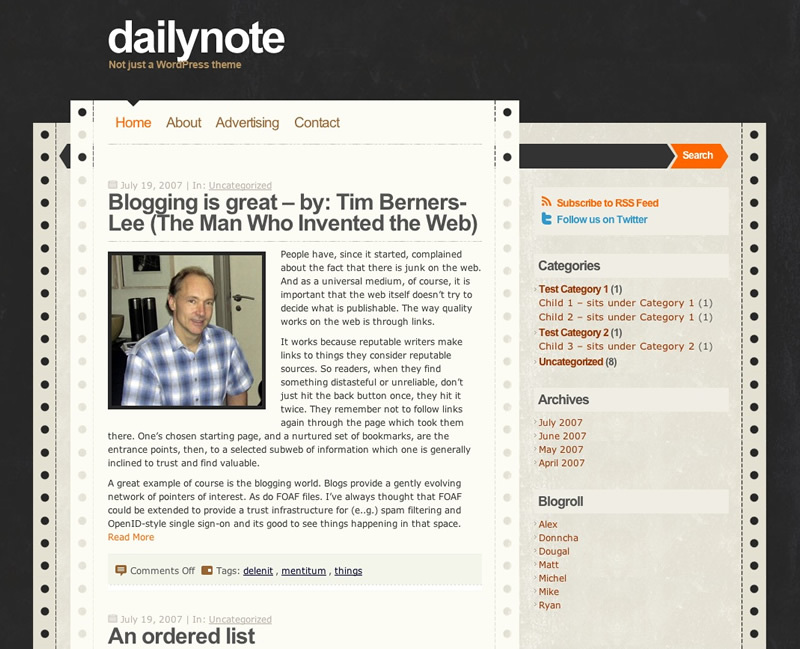 Upload your logo in the root folder of the DailyNotes theme and name it logo.png or you can use the logo.psd as a template. You will find the source in the root folder of the DailyNotes theme. This work is licensed Creative Commons Attribution-Share Alike 3.0 License. This means you may use it, and make any changes you like. Just leave the credits on footer to respect the designer’s work. Hello, thanks for theme. I’ll use my sites. Wow! What a great dish and i like this dish so much because i tried it home and it is very tasty and easy to made at home. Thank You so much. Hey, just installed your theme and it looks great! A little confused though – Is there any way to add an image thumbnail to a link-type post? Also, even with the settings disabled the author/date stamp etc is still visible in postinfo, is there any way to remove this? Given the nature of my website there will only be one author so it is unnecessary to display the information. I don’t usually comment too much on your themes but this one is awesome!! Really love it and love the color schemes!! Makes me want to start a personal blog on WordPress now ?